I liked making this because you don’t have to worry about flipping it and making sure it’s the perfect circle. You just mix the ingredients, pour into pan and then pop it in the oven! Crisp on the outside, soft in the inside! I wished mine curled more around the edges as I have seen in photos but I’ll try again next time and add some different ingredients. Preheat oven to 400 degrees. Blend together eggs, milk, flour, granulated sugar, lemon zest, and salt in a blender. Heat four 6 1/4- to 6 1/2-inch cast-iron skillets over high heat. Divide butter among them, and melt. Divide batter among them, then scatter with berries. Bake until puffed and cooked through and tops are set, 15 to 18 minutes. 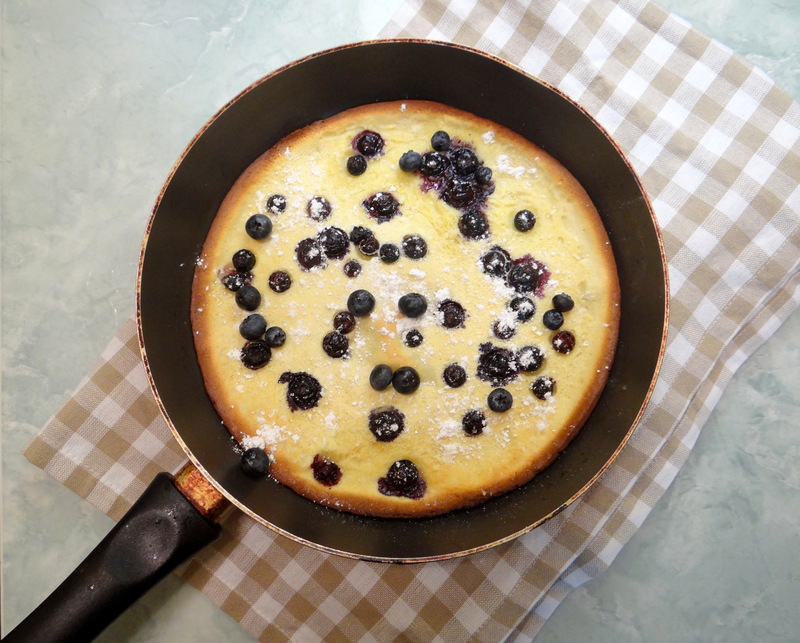 Top with berries, and sprinkle with confectioners’ sugar. Serve immediately.